The NASA website, in 2003, announced the discovery of radio lobes being found around the edge on spiral galaxy 0313-192. 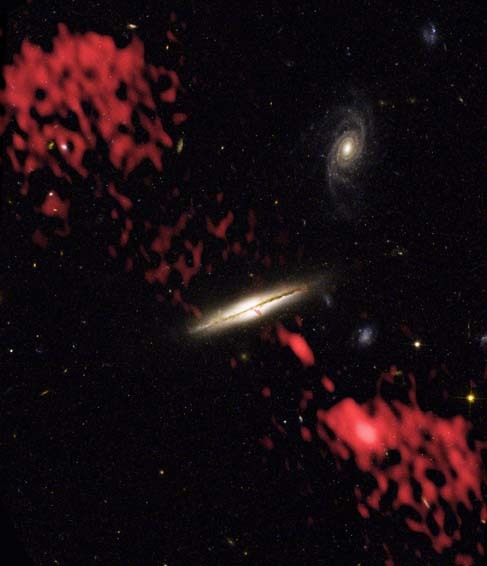 They claimed that this was “the wrong kind of galaxy” for such radio lobe features to be seen in, noting that radio lobes are normally instead seen in giant elliptical galaxies. I would counter this by saying, “No, this is the right kind of galaxy in which to expect to see radio lobes.” In fact, back in 1983, in chapter 2 of my Ph.D. dissertation I pointed out that on occasion one should expect to see radio lobes around edge-on spirals extending approximately perpendicular to their galactic plane. For those who have not had the opportunity, I recommend reading this reference which currently is available in expanded and updated form as the book Galactic Superwaves and their Impact on the Earth. A brief explanation is also given in Appendix B of my book Earth Under Fire. In my thesis I had taken the example of Centaurus A. There I pointed out that Centaurus A is actually an edge-on spiral galaxy that has an ellipsoidal appearance because its high latitude gas is scattering visible emission from the core which is not seen at the galaxy’s equator due to the light attenuating effects of its edge on “spiral arm” dust lane. 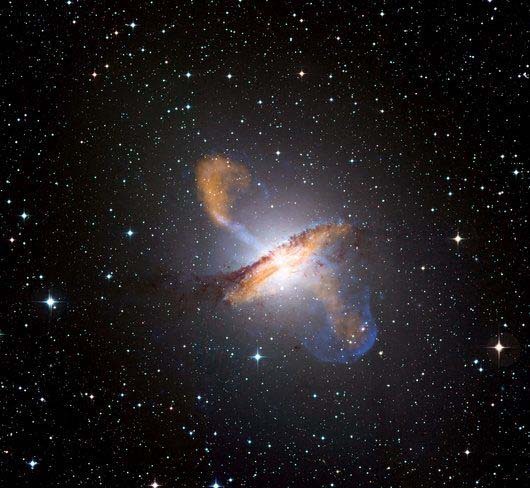 Centaurus A is the nearest galaxy to us which is observed to have an active galactic nucleus. The reason why we see it surrounded by light is because its nucleus is currently seen in its active state, as verified by the intense gamma and x-ray emission coming from its core. When its core activity shuts off, this galaxy will once again appear as an edge on spiral galaxy having little or no activity at its core. However, the cosmic rays forming its radio lobes will nevertheless continue propagating outward from the core beaming their synchrotron radio emission in our direction, just as galaxy 0313-192 is doing. Thus 0313-192 would be an example of a spiral galaxy whose core Seyfert activity has recently shut off. 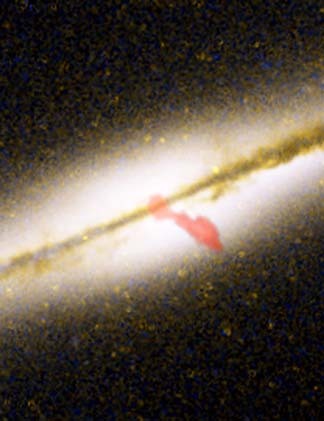 Evidence that this radio emission was associated with its core can be seen in this blow up image which shows a radio emission jet emanating from the galaxy’s core. Close up of edge-on spiral galaxy 0313-192 showing a radio emission jet coming from its core. 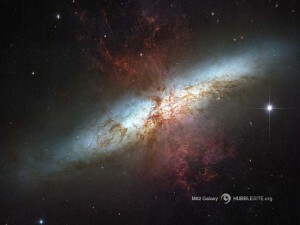 Radio lobes are also seen flanking the edge-on spiral galaxy M82 seen below. Edge-on spiral galaxy M82. The red lobes extended above and below its plane are radio emission lobes. So, the discovery of spiral radio galaxy 0313-192, showing evidence of past cosmic ray emission from its core, is far from unexpected. It in fact confirms the evolution sequence I had posited in 1983 where an edge-on active galaxy would evolve from a giant elliptical form to an edge-on spiral form as its core activity subsided. For more information about this confirmed prediction and why an edge-on spiral galaxy would generate radio lobes in this fashion, see the above two cited books.